How Do You Say “MAGA” in German? The eastern German state of Saxony is a long way from Ohio, but the two places have a lot in common. Abandoned factories are falling into ruins in both places. There is fear, anger, and despair in the cities and countryside. People are dissatisfied with the status quo and the politicians who represent it. Germany’s recent election results are alarming to many, as they mark a strong return of the extreme right, which now enters Germany’s Bundestag, or federal parliament, as the country’s third-strongest political group. But a deeper global phenomenon is at work, and it has implications for the American future. The political phenomenon known as “centrism,” whose policies reflect the worldview of long-entrenched global and political elites, is collapsing. The question now is what – and who – will take its place? Angela Merkel and her ruling Christian Democratic Union Party have returned to power for a fourth term in Germany, but they made a far weaker showing than expected. Merkel’s party had its worst electoral performance since 1949. Meanwhile, the far-right AfD or Alternative for Germany (did someone say “alt-right”?) did much better than predicted, with 12.6 percent of the vote. The neofascist AfD features an anti-Muslim, anti-immigrant message with calls for “negative immigration” and a ban on headscarves, as well as the return of some language not heard in politics since Hitler’s time. AfD politicians have criticized Berlin’s Holocaust memorial, saying Germans were the “only people in the world who planted a memorial of shame in the heart of their capital,” and have attempted to rehabilitate the political use of the word völkisch, a term closely linked with Hitler’s rhetoric and Nazis ethnonationalism. The term was used by Hitler and other Nazis to idealize and elevate what they saw as uniquely German qualities, and to to distinguish themselves from groups like Jews, Roma, and LGBT people, who they asserted did not possess those qualities. AfD’s leadership, while united in bigotry, have issued contradictory comments that are either the product of intraparty rivalries, or an orchestrated good cop/bad cop routine. It’s probably a little of both. The AfD performed especially well in states that were formerly part of the Communist German Democratic Republic. The party received 27 percent of the total vote in Saxony, for example, where protestors drew national attention last year by surrounding and terrifying refugee women and children being taken to a hostel. The green in the first map shows the areas of lowest refugee resettlement. The dark areas of the second map show where AfD gained the most votes. 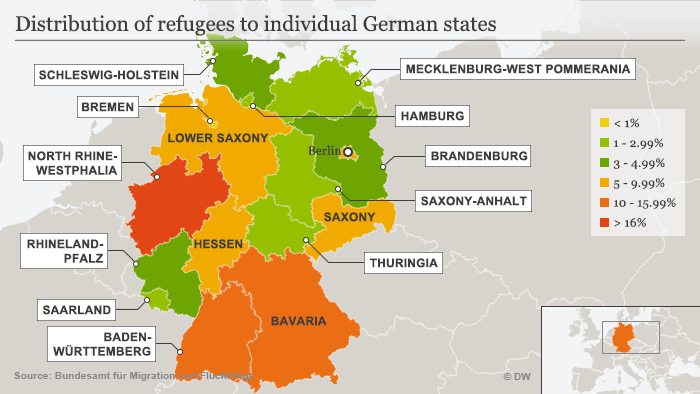 The regions that went most heavily for the AfD are the areas with the fewest resettled refugees. Some other factors must be contributing to both the hatred and the support for AfD. Is the rise of the AfD cut from the same cloth as other European far-right movements in countries like France, Great Britain, and Hungary? Does it spring from the same sources as Trumpism in the U.S.? It appears that way, although other forces are also at work. Are AfD voters simply racist “deplorables,” whose hatreds have finally been unleashed by the influx of refugees, or are they channeling economic despair into fear of outsiders? It’s rarely just one or the other. And something more than hatred and xenophobia seems to be at work in the German electorate. As the Financial Times reports, the fiscal conservatism of Germany’s ruling centrists led to a significant downsizing of government services after eastern Germany merged with the west. According to a German professor cited by the Times, the resulting lack of services – “where you have to travel 60km to the nearest district court to get a living will or… have a car registered” – enraged much of the East’s population, leaving them feeling socially and politically excluded. This professor, Hajo Funke, sees three pillars of AfD support: these disaffected voters, the far right, and protest voters. Of these, protest voters were the largest group of all, according to exit polls. They showed that 60 percent of AfD votes were directed “against all other parties,” while only 34 percent supported the AfD itself. But xenophobia tends to rise in times of economic insecurity. And despite Germany’s overall economic strength, its prosperity has not been equally shared among all its people. Salaries and pensions in the east are lower than they are in the west. Eastern Germany’s per capita GDP is only 73 percent that of western Germany, making it significantly less prosperous. Unemployment there is also two points higher. There are other cracks in Germany’s economic miracle. Long-term unemployment is a persistent problem, even though there are labor shortages in some areas, and 7 percent of Germans are employed at part-time “mini-jobs” that leave them in economic peril. Many of the factories in Germany’s eastern “rust belt” have been shut down, leading to localized pockets of joblessness and underemployment. Inequality is rising, as 27 percent increase in income for the wealthiest 10 percent was matched by an income decline of 8 percent at the lower end of the income spectrum. 82 percent of German voters think inequality has become too pronounced, and it became an issue in this year’s election. The percentage of Germans at risk of falling into poverty has risen from 11 percent to 16 percent over the last two decades. The gap between rich and poor has widened since the reunification of Germany in 1991, and Germany’s lowest earners haven’t seen their incomes rise in 15 years. The AfD drew a large number of first-time voters, which suggests that its message resonated with people who previously felt that nobody was speaking for them. That may have implications for the United States, where presidential voter turnout hit a 20-year low last year and nearly half the electorate failed to show up at the polls. The media fixation on Trump voters in MAGA hats only tells part of the story of Democrats’ defeat in 2016. Lower turnout among core Democratic voters also contributed to the party’s losses. As Matt Bruenig of the People’s Policy Project notes, only the top 2 percent of African-American households did well during the Obama years. Overall, black wealth plunged. That suggests that when it comes to voter turnout, that the Barack Obama/Hillary Clinton campaign strategy of touting the economy’s progress was ill-advised at best. Black voter turnout declined from 72 percent to 62 percent from 2012 to 2016 in Ohio, a battleground state that was hard-hit by the loss of manufacturing jobs. Young voters have traditionally been another Democratic mainstay. 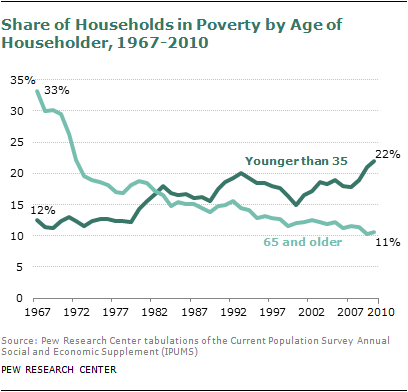 But Democrats who chastise millennials for their lack of enthusiasm should note that poverty has risen dramatically among under-35 households. Home ownership is down. As of 2016, youth unemployment had fully recovered from the 2008 recession in only four states. And student debt, which now exceeds $2.5 trillion, is burdening millions of millennials with debt before they even embark on their careers. From the banks of the Ohio River to the Ore Mountains in Saxony, discontent and fear are on the rise. It’s been a long time coming. Through Republican and Democratic administrations in the United States, and through social democratic and Christian democratic governments in Western Europe, an elite consensus held to certain core principles: Government deficits must be reined in. Government services must be privatized. “Free trade,” unhampered by democratic oversight or strong labor and environmental regulations, must be expanded. The end result has been a loss of social services, the erosion of worker rights, and growing fears about the future. The “centrist” elite is losing ground. The question is, what will replace it? While the AfD’s gains were striking, German progressive parties still outperformed it. The left-wing Die Linke party won 9.2 percent of the vote, and the Greens took 8.9 percent, for a combined total of 18.1 percent. But the combined left saw only slight growth, while the AfD’s support spiked. That’s disturbing. Tony Blair, cheerleader for this crumbling edifice of centrism, continues to stump for something he calls “the vigorous change-making center.” But Blair’s “center” had decades of “change-making” power and failed. Its slow, ongoing collapse could lead to something better, as the campaigns of Bernie Sanders in the US and Jeremy Corbyn in Great Britain have shown. Or it could lead to something much, much worse. He doesn’t know it, but he’s talking about himself and his fellow “centrists.” They’re rapidly fading into the past, as they should. The question now is, who will shape the future?